Hey hey! I am still processing my backlog of images from the last little while. So many things to photograph! This one is from a trip to the farm back in late September. We went up to catch the tail end of the fall fair, and I took advantage of a beautiful Monday morning to hang out in one of the old sheds and photograph the sun poking through the spaces in the beams. While I wasn’t quite happy with those particular shots, I was actually quite pleased with this one. 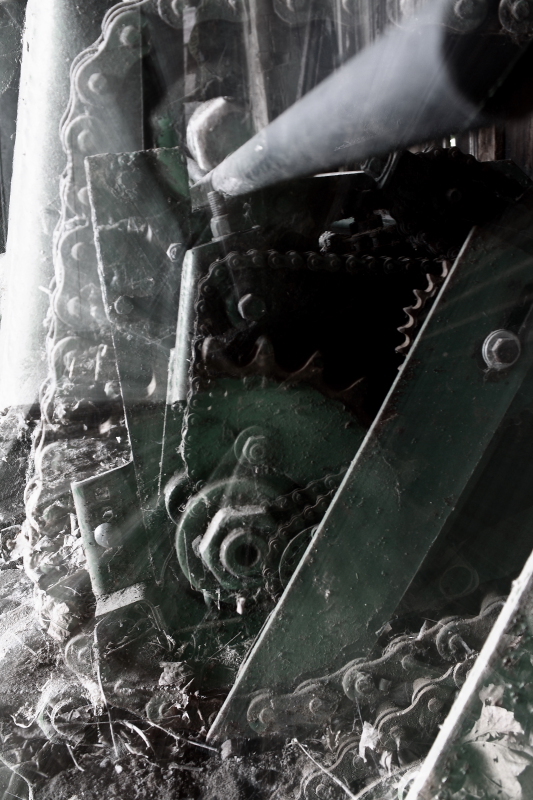 This is a zoom blast of an old mechanical part that was gathering cobwebs in a back corner. 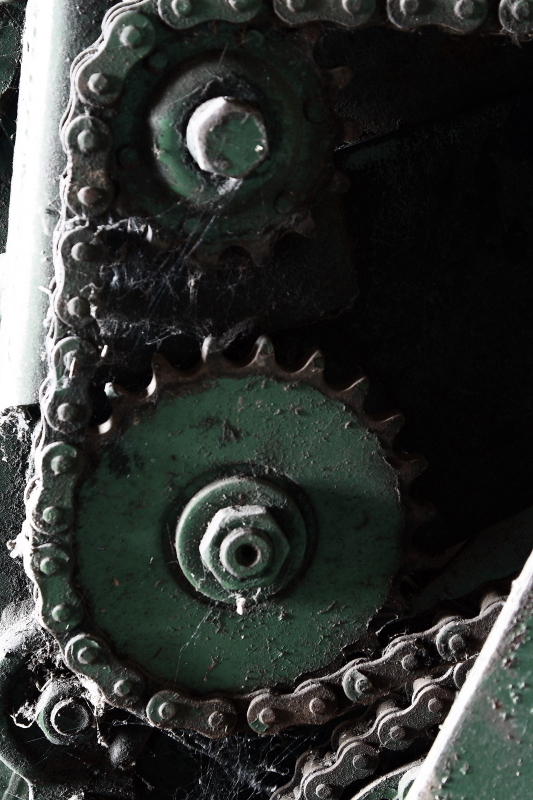 I focused in on the gears and then zoomed out in the last few seconds to create the sense of motion. I think it works better than my original composition due to both the sense of motion and also the slight abstract quality. The original, while somewhat interesting, feels a little banal to me by comparison. But I thought I’d put both out there and see how other people felt. This entry was posted in Details, Photo of the Week, Random Goodness. Bookmark the permalink. I like both! O, mechanical parts. I think I will have to agree, I like the first one as well. Not only does the zoom create a little movement, but the additional details such as that piece going from top right to bottom middle adds significantly to the composition. There is a triangular area in the middle of the first image which keeps the eye moving, unlike the second image where the eye starts at the bottom sprocket then goes up and out the right side of the frame. The first image keeps my interest and my eye bounces all around always coming back to the primary triangle formed in the middle. I am also partial to the lighting in the first image. I find the large white space at the top left of the second image to be distracting, while the lines created by the blast seem to make the white space a sort of border, gently drawing the eye up and then directing it back towards that triangle. Love the title. hehe.. Its a tough one but I do think I’m slightly leaning towards the first image as well. I like the feel of movement created by the blast.